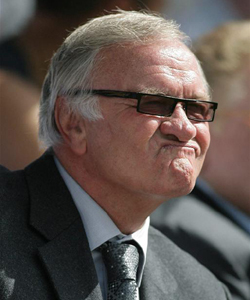 Well known racist and sunglasses wearer Ron “Big Ron” Atkinson has finally been approached for a new managerial job, over 5 years since his last post as caretaker boss at Peterborough United. It is understood that after staring at his PC screen for several weeks and repeatedly clicking the “refresh” button that the former Manchester United gaffer has been offered the post of manager at League 2 strugglers Accrington Stanley in the fictional 2015-2016 season on the PC game Football Manager. Accrington have suffered in the made-up 2015-2016 season after the loss through injury of veteran striker Steve Howard and both player manager Robbie Savage and his replacement Chris Hutchings have already been fictionally sacked in the past six months. Atkinson has targeted the strikeforce as the main area to improve, believing that “attack is the best form of defence”. He has already asked what players are available from other League 2 teams by clicking his mouse a few times and talking to the screen like he’s having an actual conversation with other managers. However after being offered Adebayo Akinfenwa by League 2 new boys Woking he made some excuses about the player not being quite right, despite an excellent goalscoring record at that level. Ron is thought to be fictionally interested in approaching the PC version of Lee Bowyer to work on his coaching staff. Whilst his contract at Accrington is short term, Atkinson has already thought about the future. “If this computer thing doesn’t work out I’ll try that play by mail” he said, spilling pickle from his sandwich over his mouse mat.